This article is about devices designed to perform tasks. For other uses, see Machine (disambiguation). Renaissance natural philosophers identified six simple machines which were the elementary devices that put a load into motion, and calculated the ratio of output force to input force, known today as mechanical advantage. Modern machines are complex systems that consist of structural elements, mechanisms and control components and include interfaces for convenient use. Examples include a wide range of vehicles, such as automobiles, boats and airplanes, appliances in the home and office, including computers, building air handling and water handling systems, as well as farm machinery, machine tools and factory automation systems and robots. The English word machine comes through Middle French from Latin machina, which in turn derives from the Greek (Doric μαχανά makhana, Ionic μηχανή mekhane "contrivance, machine, engine", a derivation from μῆχος mekhos "means, expedient, remedy"). 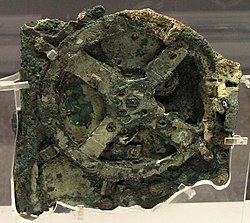 The word mechanical (Greek: μηχανικός) comes from the same Greek roots. A wider meaning of "fabric, structure" is found in classical Latin, but not in Greek usage. This meaning is found in late medieval French, and is adopted from the French into English in the mid-16th century. Machine, or Engine, in Mechanicks, is whatsoever hath Force sufficient either to raise or stop the Motion of a Body... Simple Machines are commonly reckoned to be Six in Number, viz. the Ballance, Leaver, Pulley, Wheel, Wedge, and Screw... 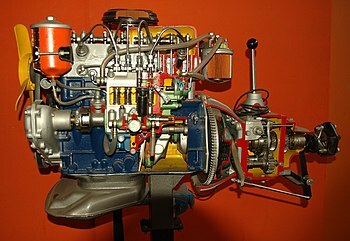 Compound Machines, or Engines, are innumerable. 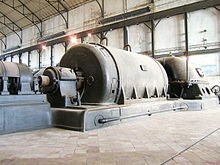 The word engine used as a (near-)synonym both by Harris and in later language derives ultimately (via Old French) from Latin ingenium "ingenuity, an invention". Starting in the later part of the 18th century, there began a transition in parts of Great Britain's previously manual labour and draft-animal-based economy towards machine-based manufacturing. It started with the mechanisation of the textile industries, the development of iron-making techniques and the increased use of refined coal. Wedge (hand axe): Perhaps the first example of a device designed to manage power is the hand axe, also called biface and Olorgesailie. A hand axe is made by chipping stone, generally flint, to form a bifacial edge, or wedge. A wedge is a simple machine that transforms lateral force and movement of the tool into a transverse splitting force and movement of the workpiece. The available power is limited by the effort of the person using the tool, but because power is the product of force and movement, the wedge amplifies the force by reducing the movement. This amplification, or mechanical advantage is the ratio of the input speed to output speed. For a wedge this is given by 1/tanα, where α is the tip angle. The faces of a wedge are modeled as straight lines to form a sliding or prismatic joint. A mechanical system manages power to accomplish a task that involves forces and movement. Modern machines are systems consisting of (i) a power source and actuators that generate forces and movement, (ii) a system of mechanisms that shape the actuator input to achieve a specific application of output forces and movement, (iii) a controller with sensors that compare the output to a performance goal and then directs the actuator input, and (iv) an interface to an operator consisting of levers, switches, and displays. Human and animal effort were the original power sources for early machines. The assemblies that control movement are also called "mechanisms." 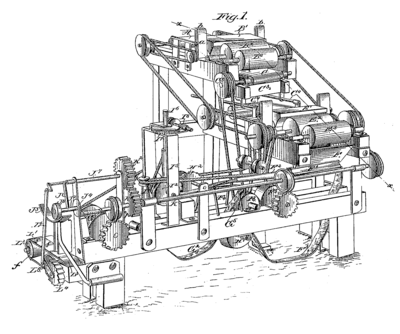 Mechanisms are generally classified as gears and gear trains, which includes belt drives and chain drives, cam and follower mechanisms, and linkages, though there are other special mechanisms such as clamping linkages, indexing mechanisms, escapements and friction devices such as brakes and clutches. A cam and follower is formed by the direct contact of two specially shaped links. The driving link is called the cam (also see cam shaft) and the link that is driven through the direct contact of their surfaces is called the follower. The shape of the contacting surfaces of the cam and follower determines the movement of the mechanism. Schematic of the actuator and four-bar linkage that position an aircraft landing gear. A planar mechanism is a mechanical system that is constrained so the trajectories of points in all the bodies of the system lie on planes parallel to a ground plane. The rotational axes of hinged joints that connect the bodies in the system are perpendicular to this ground plane. A spherical mechanism is a mechanical system in which the bodies move in a way that the trajectories of points in the system lie on concentric spheres. The rotational axes of hinged joints that connect the bodies in the system pass through the center of these circle. A spatial mechanism is a mechanical system that has at least one body that moves in a way that its point trajectories are general space curves. The rotational axes of hinged joints that connect the bodies in the system form lines in space that do not intersect and have distinct common normals. A flexure mechanism consists of a series of rigid bodies connected by compliant elements (also known as flexure joints) that is designed to produce a geometrically well-defined motion upon application of a force. The elementary mechanical components of a machine are termed machine elements. These elements consist of three basic types (i) structural components such as frame members, bearings, axles, splines, fasteners, seals, and lubricants, (ii) mechanisms that control movement in various ways such as gear trains, belt or chain drives, linkages, cam and follower systems, including brakes and clutches, and (iii) control components such as buttons, switches, indicators, sensors, actuators and computer controllers. While generally not considered to be a machine element, the shape, texture and color of covers are an important part of a machine that provide a styling and operational interface between the mechanical components of a machine and its users. The biological molecule myosin reacts to ATP and ADP to alternately engage with an actin filament and change its shape in a way that exerts a force, and then disengage to reset its shape, or conformation. This acts as the molecular drive that causes muscle contraction. Similarly the biological molecule kinesin has two sections that alternately engage and disengage with microtubules causing the molecule to move along the microtubule and transport vesicles within the cell, and dynein, which moves cargo inside cells towards the nucleus and produces the axonemal beating of motile cilia and flagella. "[I]n effect, the [motile cilium] is a nanomachine composed of perhaps over 600 proteins in molecular complexes, many of which also function independently as nanomachines...Flexible linkers allow the mobile protein domains connected by them to recruit their binding partners and induce long-range allostery via protein domain dynamics. " Other biological machines are responsible for energy production, for example ATP synthase which harnesses energy from proton gradients across membranes to drive a turbine-like motion used to synthesise ATP, the energy currency of a cell. Still other machines are responsible for gene expression, including DNA polymerases for replicating DNA, RNA polymerases for producing mRNA, the spliceosome for removing introns, and the ribosome for synthesising proteins. These machines and their nanoscale dynamics are far more complex than any molecular machines that have yet been artificially constructed. These molecules are increasingly considered to be nanomachines. ^ a b Usher, Abbott Payson (1988). A History of Mechanical Inventions. USA: Courier Dover Publications. p. 98. ISBN 978-0-486-25593-4. Archived from the original on 2016-08-18. ^ Asimov, Isaac (1988), Understanding Physics, New York, New York, USA: Barnes & Noble, p. 88, ISBN 978-0-88029-251-1, archived from the original on 2016-08-18. ^ Ostdiek, Vern; Bord, Donald (2005). Inquiry into Physics. Thompson Brooks/Cole. p. 123. ISBN 978-0-534-49168-0. Archived from the original on 2013-05-28. Retrieved 2008-05-22. ^ Strizhak, Viktor; Igor Penkov; Toivo Pappel (2004). "Evolution of design, use, and strength calculations of screw threads and threaded joints". HMM2004 International Symposium on History of Machines and Mechanisms. Kluwer Academic publishers. p. 245. ISBN 1-4020-2203-4. Archived from the original on 2013-06-07. Retrieved 2008-05-21. ^ a b Krebs, Robert E. (2004). Groundbreaking Experiments, Inventions, and Discoveries of the Middle Ages. Greenwood Publishing Group. p. 163. ISBN 978-0-313-32433-8. Archived from the original on 2013-05-28. Retrieved 2008-05-21. ^ Stephen, Donald; Lowell Cardwell (2001). Wheels, clocks, and rockets: a history of technology. USA: W. W. Norton & Company. pp. 85–87. ISBN 978-0-393-32175-3. Archived from the original on 2016-08-18. ^ Armstrong-Hélouvry, Brian (1991). Control of machines with friction. USA: Springer. p. 10. ISBN 978-0-7923-9133-3. Archived from the original on 2016-08-18. ^ Pennock, G. R., James Watt (1736-1819), Distinguished Figures in Mechanism and Machine Science, ed. M. Ceccarelli, Springer, 2007, ISBN 978-1-4020-6365-7 (Print) 978-1-4020-6366-4 (Online). 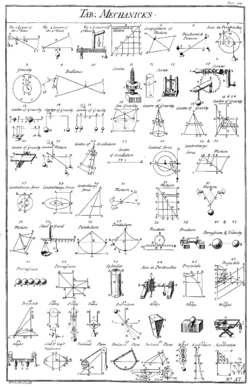 ^ Chambers, Ephraim (1728), "Table of Mechanicks", Cyclopaedia, A Useful Dictionary of Arts and Sciences, London, England, Volume 2, p. 528, Plate 11 . ^ Hartenberg, R.S. & J. Denavit (1964) Kinematic synthesis of linkages Archived 2011-05-19 at the Wayback Machine, New York: McGraw-Hill, online link from Cornell University. ^ a b c J. J. Uicker, G. R. Pennock, and J. E. Shigley, 2003, Theory of Machines and Mechanisms, Oxford University Press, New York. ^ J. M. McCarthy and G. S. Soh, 2010, Geometric Design of Linkages, Archived 2016-08-19 at the Wayback Machine Springer, New York. ^ Satir, Peter; Søren T. Christensen (2008-03-26). "Structure and function of mammalian cilia". Histochemistry and Cell Biology. 129 (6): 687–93. doi:10.1007/s00418-008-0416-9. PMC 2386530. PMID 18365235. 1432-119X. ^ Kinbara, Kazushi; Aida, Takuzo (2005-04-01). "Toward Intelligent Molecular Machines: Directed Motions of Biological and Artificial Molecules and Assemblies". Chemical Reviews. 105 (4): 1377–1400. doi:10.1021/cr030071r. ISSN 0009-2665. PMID 15826015. ^ "U.S. Patent and Trademark Office, Patent# 40891, Toy Automaton". Google Patents. Retrieved 2007-01-07. ^ A. P. Usher, 1929, A History of Mechanical Inventions Archived 2013-06-02 at the Wayback Machine, Harvard University Press (reprinted by Dover Publications 1968). ^ L. W. Tsai, Robot Analysis: The mechanics of serial and parallel manipulators, John-Wiley, NY, 1999. Oberg, Erik; Franklin D. Jones; Holbrook L. Horton; Henry H. Ryffel (2000). Christopher J. McCauley; Riccardo Heald; Muhammed Iqbal Hussain (eds.). Machinery's Handbook (26th ed.). New York: Industrial Press Inc. ISBN 978-0-8311-2635-3. Oberg, Erik; Franklin D. Jones; Holbrook L. Horton; Henry H. Ryffel (2000). Christopher J. McCauley; Riccardo Heald; Muhammed Iqbal Hussain (eds.). Machinery's Handbook (30th ed.). New York: Industrial Press Inc. ISBN 9780831130992. 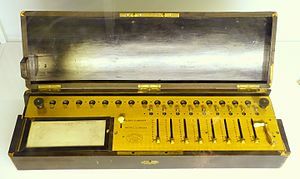 Wikimedia Commons has media related to Machines.